Hip Baby is now carrying the local, handmade Growth Ruler from the Sunrise Ruler Company. Designed & made in Vancouver B.C., by wood artisan Nick Vorstermans & interior designer Rosemary Sleigh, it is a beautiful oversized replica of the classic wooden ruler. 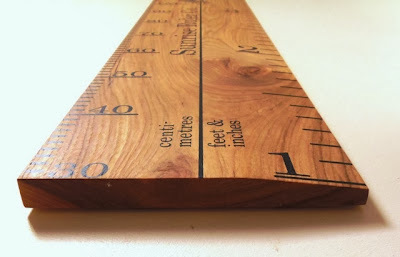 Featuring a wide bevelled edge, just like the real thing, it has both Metric & Imperial measurements. It will be a family heirloom that travels wherever you do…no more marking on walls & door trims! Available in-store or by phone orders at 604-736-8020.